Do your students need practice with finding, identifying, and editing sentences, paragraphs, letters, dates, cities, and states? 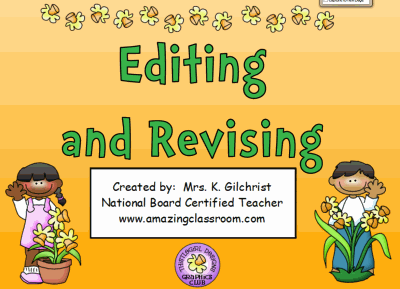 This file will give your students the extra practice they need editing & revising. It includes many pages of interactivity along with tons of voting questions to use as a formative and/or summative assessment. This Smart Notebook lesson includes many cute thistlegirl designs and fun sounds! Download the worksheet too! This Smart Notebook lesson will surely have your students knowing the differences between the confusing to, too, and two homophone words. This file is loaded with 'Activity Builder' matching interactive pages for the students to complete along with fill in the blanks and Response voting assessment. This 26 page flipchart is absolutely adorable with images licensed from thistlegirldesigns.com. Also download the attached simple homophone worksheet! Do you want to create your own Jeopardy games, but don't have the time? Now with this neatly designed, bright and colorful template you can create Jeopardy style games for your classroom in a snap! Just add your own categories, questions, and answers! The arrows keep score by the hundreds for up to 4 teams. This Smart Notebook file contains 54 pages: 25 question pages, 25 answer pages, a game board, a scoreboard, and instructions. Have fun! Do you put morning work on the board for your students? This Smart Notebook lesson file contains math morning work for 25 days of school. This morning work covers number sense, algebraic relationships, geometry, measurement, money, and data and probability. No more creating morning work for your students, just pull up this flipchart each morning and display one of these 25 pages on your interactive whiteboard. Have fun learning! 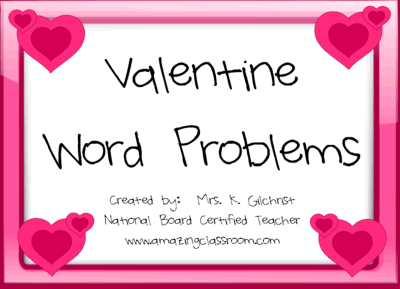 Your students will have a fun time solving these Valentine's Day themed math word problems. The colorful backgrounds and graphics will be sure to keep them interested in the lesson. This flipchart focuses on addition, subtraction, and multiplication with Valentine's Day themed word problems you and your students will be sure to love! After they've solved the problem, have them click the answer button to see if they got it right. Have Fun! In this Smartboard lesson, your students will be able to identify figures that have been flipped, slid, or turned. This Notebook flipchart contains 29 pages of colorful graphics, activities, sounds, games, and voting. 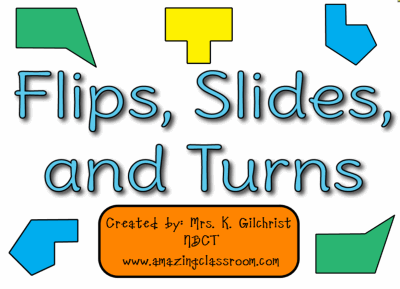 Students will learn all about flips, slides, and turns, manipulate shapes, and play games. A simple worksheet with answer key is also attached here for more motion geometry practice. 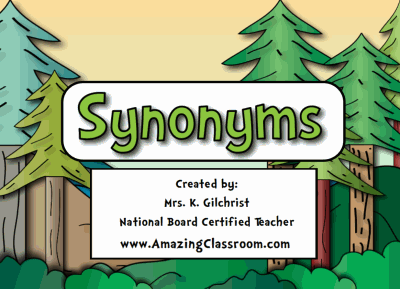 With this Smart Notebook lesson, your students will be able to define and identify synonyms. This file begins by stating the objectives, then introducing students to examples of synonyms. Container activities add interactivity and fun to the lesson. There are over 26 colorful pages of interactive games, activities, and voting for use with Response voting devices. Also download the attached PDF, which is a list of common synonym pairs. Have fun! 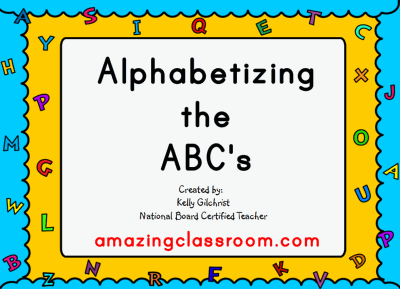 In this Smart Notebook lesson, your students will learn ABC (alphabetical) order. 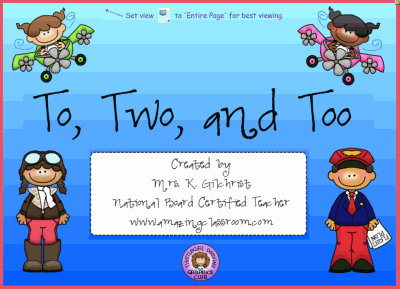 This lesson allows students to interact multiple times with your Smartboard/whiteboard. The students will sort letters of the alphabet, pictures with words, and pictures without words into alphabetical order. This file includes multiple voting pages for Response Voting assessment and links to interactive online games to practice their skills. 30 pages - Enjoy! 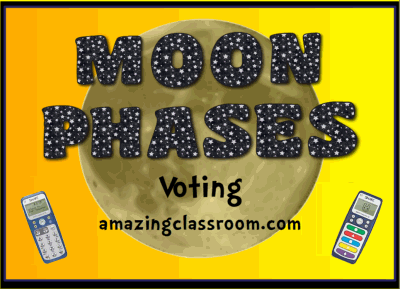 This Smart Notebook lesson is an excellent resource for reviewing the eight different phases of the Moon. This file includes multiple pages for students to vote using Response Voters. The students also interact with the lesson by putting the eight phases of the moon in order and placing the correct name on each phase. 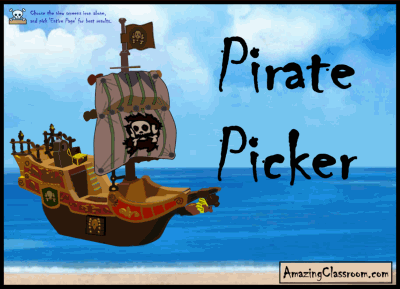 This random student pirate picker is great for those who are teaching a thematic unit on pirates, or for those who just want to add fun and fascination to their day by picking their students the pirate way! After a simple one time set-up, toss a koosh ball at the board, or have a student randomly pick a skull. An instruction page is included that describes how to change the names to your students.